The restaurant inside an L.A. architectural icon has closed. Sadly, wannabe George Jetsons will no longer be able to pick up a cocktail at Encounter — the now-former restaurant inside LAX's Theme Building. 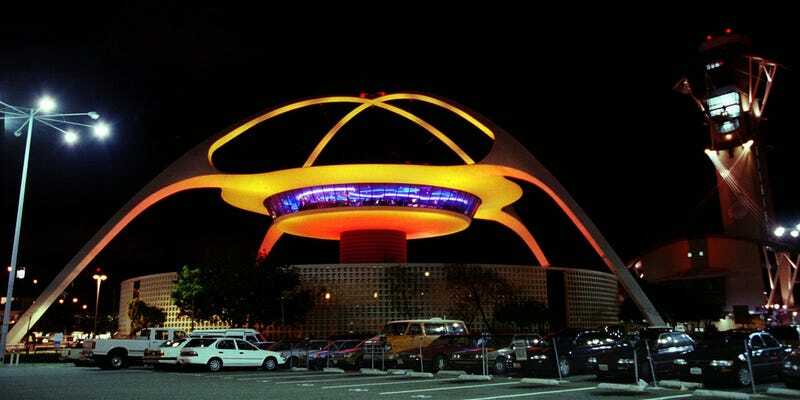 If you've ever flown through the L.A. airport you've no doubt noticed the space age, Googie-styled Theme Building. It was originally constructed in 1961, just a year before The Jetsons would debut on American TV. Stylistically, the building was arguably one of the most influential pieces of architecture for 1960s pop futurists. However, the restaurant inside never could find its footing. The restaurant first opened in 1997, but hasn't exactly been a hallmark of L.A. cuisine. When pieces of the building started falling off in 2007, it was closed until a $12 million restoration in 2010. But, despite the facelift, the last three years obviously haven't been terribly kind to the restaurant inside.